Wet, Dry or Greasy Areas. Nitrile rubber cushion provides maximum resistance to water, oils, grease, chemicals and animal fats. Superior anti fatigue, Light weight, easy to clean, this mat will out perform most thicker and heavier mats. Supported by a cross step construction on the underside ensures minimal movement on top of the floor and makes it one of the most stable mats in the range. Espesially in commercial Kitchens. Ideal for use in kitchens and bar areas, food processing areas, machine shops and other heavy industrial applications. Superior anti-fatigue properties ensure employee comfort and ergonomic benefits. 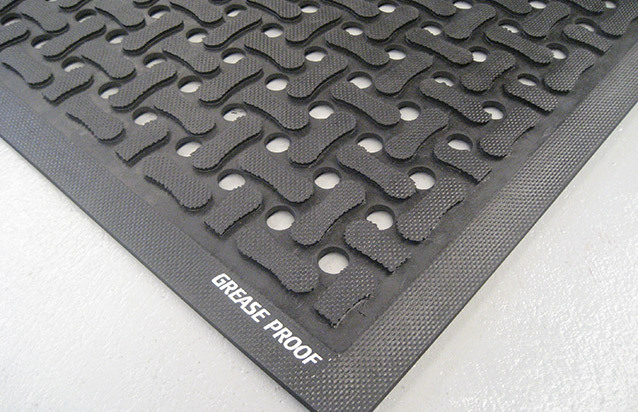 Lightweight easy to clean material outperforms most thicker and heaver mats, 100% high-density closed-cell Nitrile Ruber cushion provides maximum resistance to water, oils, greases, chemicals and animal fats. 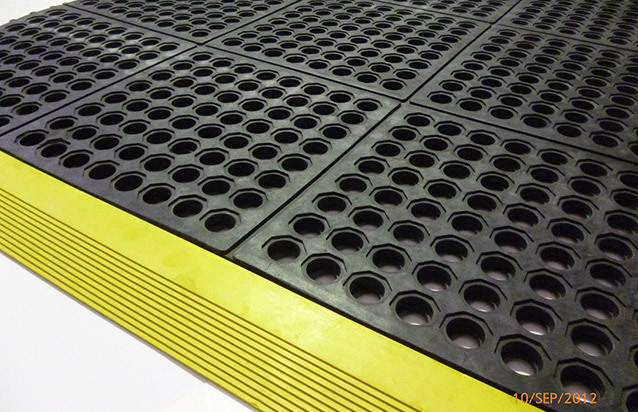 Low profile edges around the mat and a slip-resistant surface help minimize trip and fall accidents. Light weight and easy to clean. Comfort Flow with holes allows liquid and debris flow easily thorough the holes and away from shoes. Also available without holes.